The best part about changing my food choices is getting creative with cooking. I still crave the comfort foods or sweets, but have learned healthier ways to prepare them. The other day I had a major craving for lasagna, and while I can’t take credit for substituting zucchini for noodles, the rest of the recipe is my own. My husband and I had every intention of eating it raw, but I’ve found that during the winter a warm meal every now and then is very satisfying. Blend the cashews and sunflower seeds with enough water to get it mixed smoothly. Then add the seasonings and more water, if needed to get a ricotta cheese texture. Empty the contents into a bowl and set aside. Without rinsing the blender, throw in the Roma tomatoes and sun-dried tomatoes and blend until smooth. Add seasonings to taste and olive oil. If you want a thinner sauce, add more water. 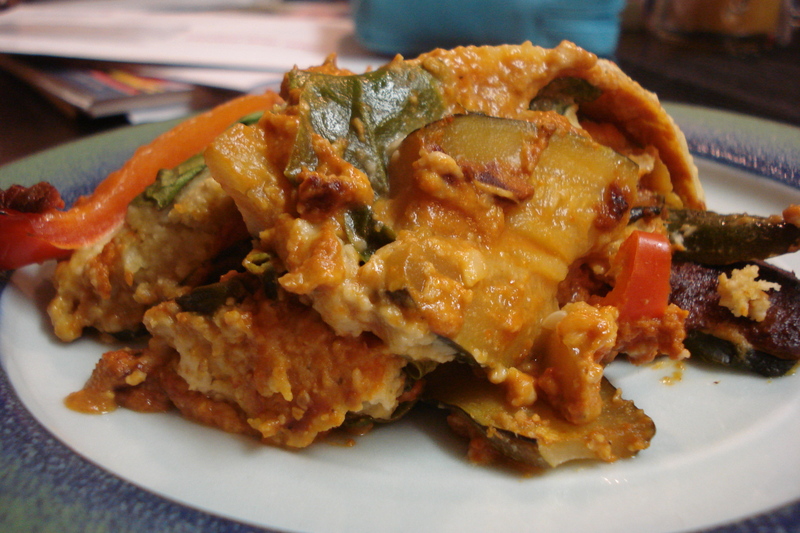 Pour a little marinara sauce on the bottom of a baking dish – enough to lightly cover the surface. 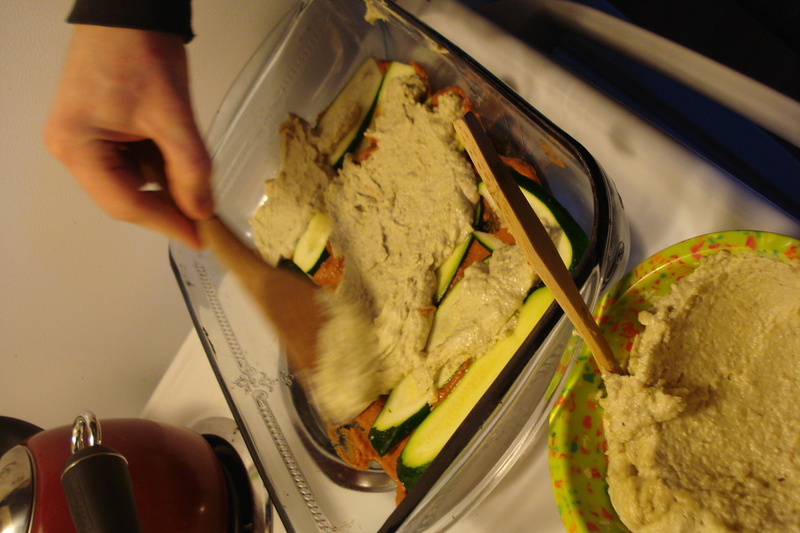 Then arrange a layer of zucchini slices. Add a layer of “cheese,” followed with fresh spinach and red bell pepper. Continue the layers until you’ve filled your baking dish. I ended up with three layers of zucchini noodles. Top off your layers with marinara sauce and a sprinkle of nutritional yeast if you’d like. Then enjoy as is or bake in the oven at 350 for an hour! We devoured it….so full of flavor and cheesy!